In keeping with the contemporary style displayed throughout the home, the same dark custom cabinetry was designed in the upstairs secondary bathrooms as well. The oversized metallic hardware adds dimension and interest to the vanity, while the simple white Quartz countertops help to avoid from making the space feel busy. 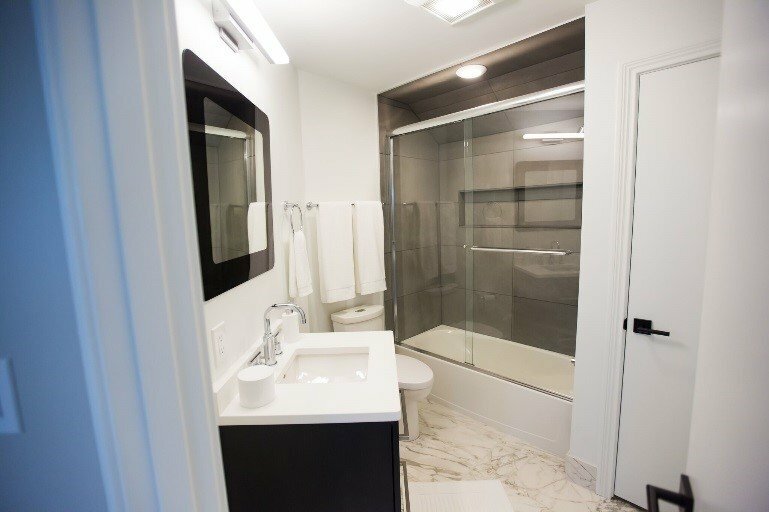 Rectilinear porcelain tile to mimic the look of a natural marble was installed on the floors to add texture to the room, and the large faux concrete porcelain wall tiles in the shower create a sense of balance in the bathroom still giving an overall calming feeling throughout the space. 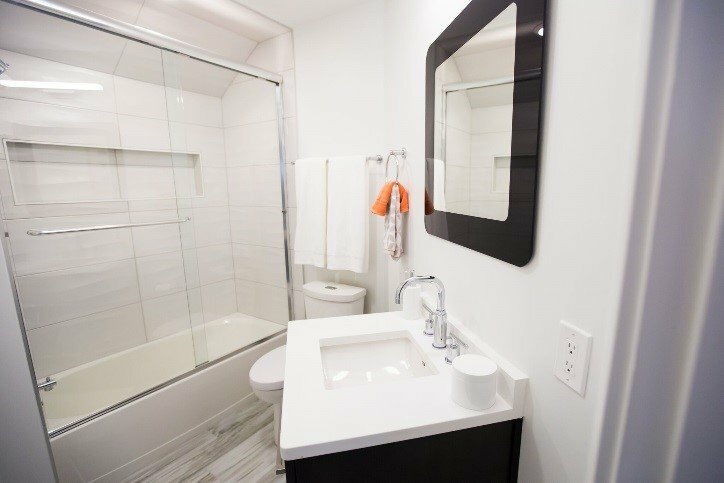 The same cabinetry, countertops, & floor tile was used in an adjacent bathroom to help create a sense of consistency and flow throughout the home. 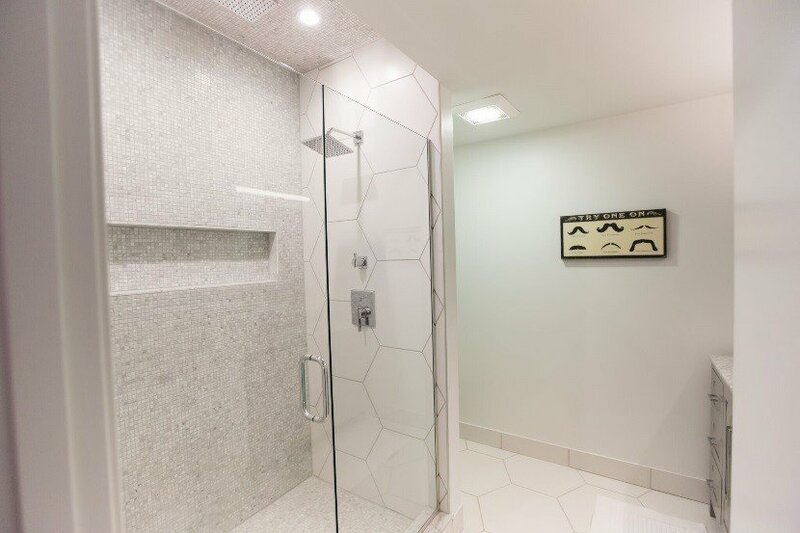 12”x35” dimensional wavy ceramic tile was used in the shower to freshen up the room and keep it feeling light and bright. 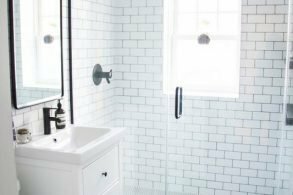 The waviness of the tile combined with the soft edges of the mirror, faucet, undermount sink, & corners of the countertop soften the harsh lines seen throughout the rest of the bathroom. In the powder room, a floating vanity with recessed drawers was designed to add dimension to an otherwise flat surface, making the vanity appear more as a piece of furniture. 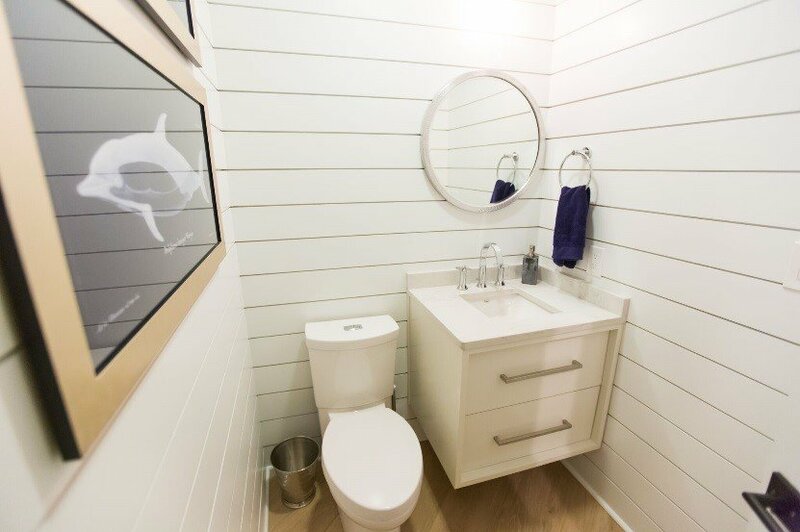 Quartz countertops, a square undermount sink, and shiplap walls complete this contemporary bathroom design. 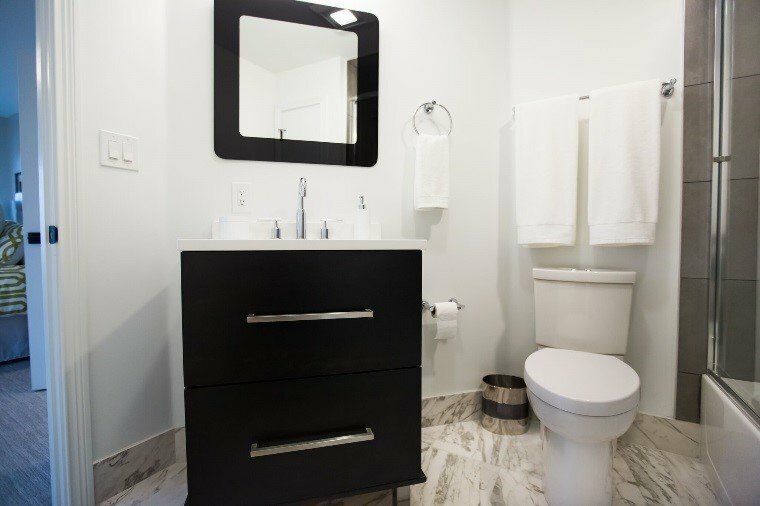 A variety of textures, shapes, sizes, & colors were used throughout the lower level bathroom making the space feel whimsical, yet sophisticated. White hexagonal ceramic tile was installed on the bathroom floor & on two walls of the shower. Contrastingly smaller format mosaics on the ceiling, back wall, & floor in the shower create a dynamic feel in the room. 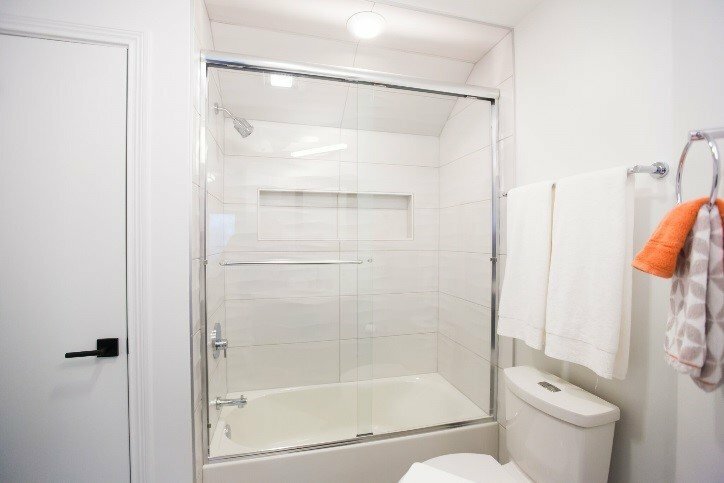 The large rectangular recessed niche and frameless clear glass emphasize the spaciousness of the shower. 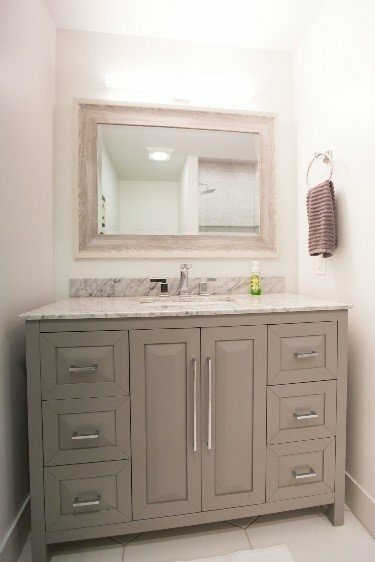 A freestanding vanity with a Carrera marble countertop allows for a proper amount of storage in the room and the warm gray and white tones compliment the tile throughout the entire bathroom. Although similar in design, style, & feel, at least one unique feature was added in each bathroom in the home. Now grab your favorite drink and meet us in the lower level bar. We will take you through the entire re-design.